Report by Major Tunbridge about Elands River, 15 September 1900, page 4. 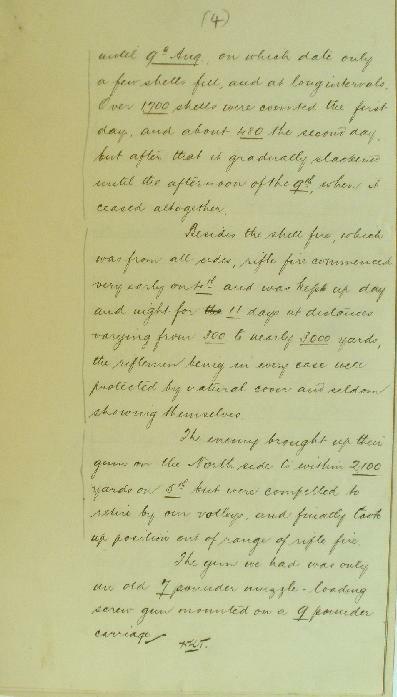 On 15 September 1900, Major Tunbridge wrote a report of the action at Elands River for the NSW General Staff of which page 4 is transcribed below. … until 9th August, on which date only a few shells fell, and at long intervals. Over 1,700 shells were counted the first day, and about 480 the second day, but after that it gradually slackened until the afternoon of the 9th when it ceased altogether. Besides the shell fire, which was from all sides, rifle fire commenced very early on 4th and was kept up day and night for 11 days at distances varying from 300 to nearly 3,000 yards, the riflemen being in every case well protected by natural cover and seldom showing themselves. The enemy brought up their guns on the North side within 2,100 yards on 5th but were compelled to retire by our volleys, and finally took up position out of range of rifle fire.